Access to important and timely information related to the current crop and the industry at-large. Professional development and networking opportunities. Representation on National legislative issues. More visiblitiy with retailers, foodservice professionals, educators, and the home consumer. Below you will find several other ways the association is bringing even more value to your membership. In an effort to help solve the transportation challenges that occur with shipping produce, the NOA is pleased to offer this program to their active members. Be teaming up with Western Growers and C.H. Robinson Transportation, this FREE program is designed to combine shipper tonnage to leverage transportation rates, equipment supply, and service — without volume commitments! Program is designed to combine shipper tonnage to leverage rates, equipment supply, and service. All types of transportation services are provided, including truckload, LTL, intermodal as well as international services, such as customs, ocean freight, and air freight. A CHRW account manager is assigned to each shipper, providing one-call service for all supply chain needs. On Monday mornings, shippers receive a weekly transportation update via email that includes market conditions, industry hot topics, and freight rate forecasts from multiple growing regions to destinations throughout the U.S. and Canada. Freight rates are customized according to shipper requirements. Rates offered include seasonal or yearly pricing, ad and promotional pricing, weekly lid pricing, and spot market rates designed to take advantage of short term favorable changes in the transportation market. CHRW provides 24/7/365 communication and monitoring of all shipments. CHRW's robust carrier base (over 50,000 contract motor carriers) provides excellent surge capacity coverage during seasonal and holiday demand periods. CHRW assumes responsibility for handling and resolution of logistics related carrier claims. 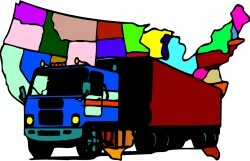 CHRW's online technology platform provides the shipper complete visibility to their shipments 24/7/365, and their user-friendly software allows shippers to easily analyze their transportation costs, service levels, and a variety of other metrics through business intelligence reports customized to the needs of the individual shipper. Use of the Transportation Program is free, without volume commitments, and is available to all active NOA members throughout the country. The Program is turn-key and can be accessed through a single phone call or email to C. H. Robinson. For more information or immediate use, contact John Stenderup at (866) 771-1270 or at John.Stenderup@chrobinson.com. This program is available to grower/shipper, shipper, broker, and supplier members of participating trade associations and has moved over 150,000 loads since its inception in 2006. It was developed in response to concerns by the Western Growers Association Board of Directors regarding transportation costs, equipment supply, and service quality. The success of the program in resolving these issues for Western Growers shippers led to licensing of the Program to other produce and nursery trade associations throughout the U.S. Present licensees include the major associations in California, Idaho, Texas, Florida, Oregon and Georgia. The Transportation Program is operated on behalf of the participating trade associations by C. H. Robinson Worldwide (CHRW), a leading international 3rd party logistics company. NOA Members Save up to 20% or more! Use your Budget Member Savings Card that came with your Annual Membership Directory for special savings and discounts every time you rent. Mention the Budget Card Discount number (BCD #) on the card when you make a reservation to receive any discounts. Proof of membership required at time of rental.